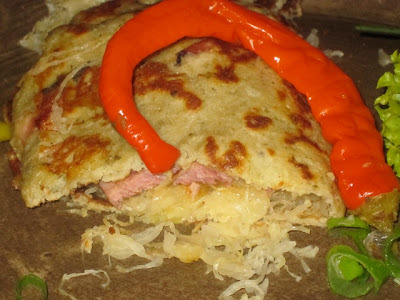 I'll be honest at the risk of offending lovers of Czech cuisine. When someone tells me, a place does a great koleno (pork knee), I don't go rushing over to check it out. I've eaten large quantities of Czech food over the years. 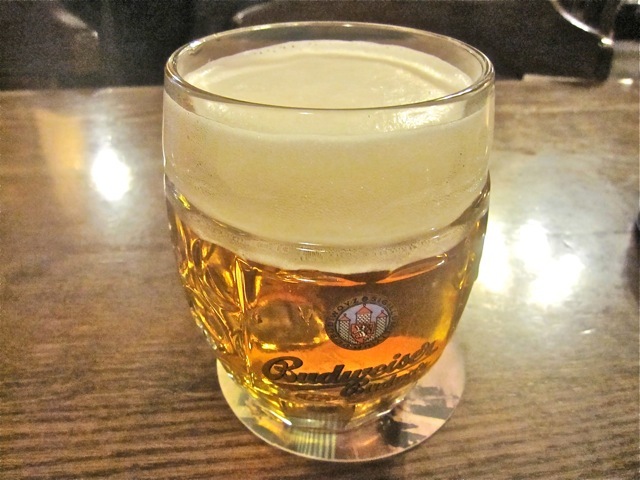 But that's partly because I have also consumed large quantities of Czech beers over the years. 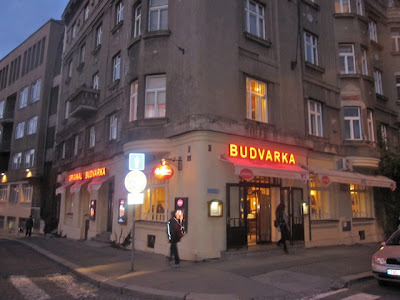 So when I agreed to meet a friend in Dejvice a couple of months ago, I chose Budvarka. Their yeast lager had been beckoning me to come for a long time. 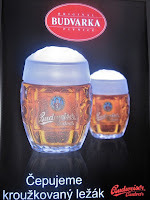 Finally, I got to try the Budvar kroužkovaný ležák (33 CZK). It's rare to find this beer on tap in Prague, and I'm not sure why. I really loved its clean, crispy flavor. And there was something extra-fine about the carbonation. I was hooked. Looking for an excuse to go back more recently, I found my inspiration in an entry on The Prague Post blog, which said the food was much improved from earlier years. And another friend told me he'd tried the koleno and duck and enjoyed it. So I went with the English Patient and A Lady Friend. The interior was pleasant enough, with attractive wood-paneled ceilings and brass fixtures. There are separate smoking and non-smoking rooms. There is something of a standardized quality that gives it the look of a model for future franchises. ALF started with a glass of hot wine (50 CZK). I thought it would be red, but they served the white variety. She said it was fine. EP and I started in on the kroužkovaný ležák. ALF ordered a bowl of the zelňačka (38 CZK). 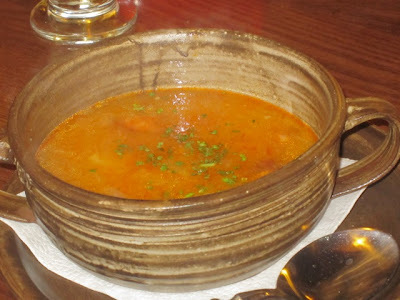 The pork and cabbage soup was good, with nice chunks of ham, It was on the sour side. We both agreed we'd had better. I got the venison pâté with basil pesto (75 CZK). 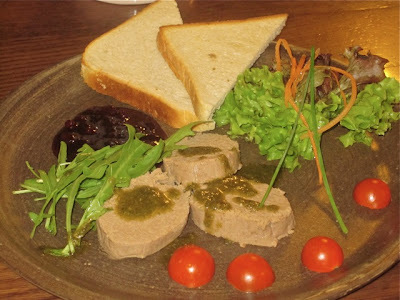 The chopped liver had a dry, grainy texture. It crumbled and was hard to spread on the ordinary, boring white toast. The only thing that livened it up at all was the jarred cranberry compote from on the side. 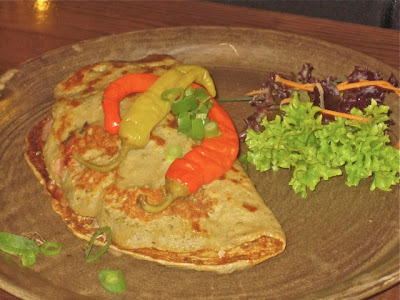 For a main course, EP had the Cmunda po Kaplicku or Kaplice-style potato pancake (110 CZK). The pancake itself was thin and very dry. Oddly, even the sauerkraut filling had a dryness to it. But there was one positive note. There was a generous amount of good-quality smoked pork. Overall, neither of us liked this dish. ALF tried the ginger chicken wings (125 CZK). 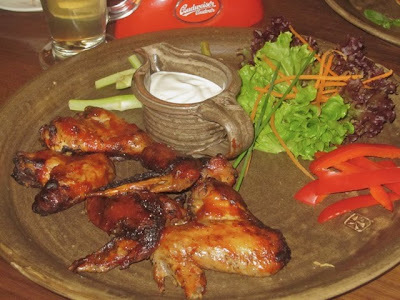 The unseparated wings, with the tips on, were cooked competently. They had a crunchy skin with juicy meat underneath. The flavor was less pleasing. I didn't taste ginger. ALF said it reminded her of "UHO." The acronym stands for "univerzální hnědá omáčka," which translates as "universal brown sauce." We didn't like it. I felt guilty for not following the recommendations on the duck or koleno, but I didn't want those. I ordered the krkovička or grilled pork neck (145 CZK). 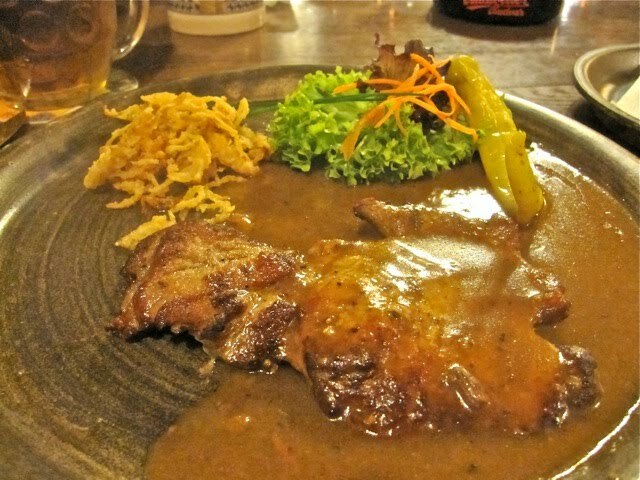 It was served under a goulash sauce with batter-fried onions on the side. I've had some wonderful, juicy, tender, tasty pork necks in my day. This was not one of them. Under that salty sauce, the meat was tough and hard to cut. The onions were dried out and not hot. 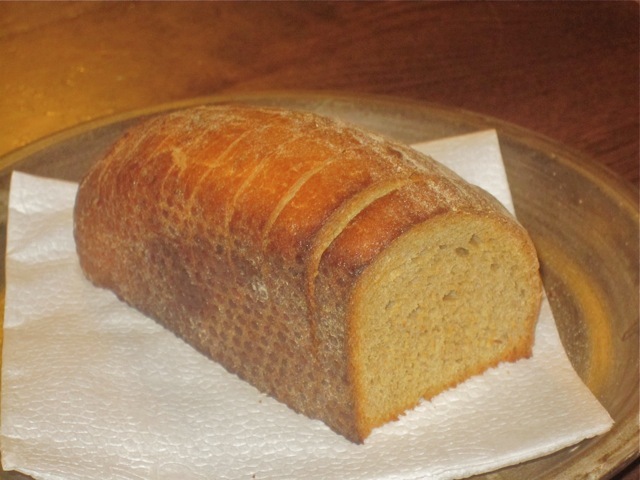 The only thing I liked was the warm, toasted mini-loaf of Czech bread that came on the side. I enjoyed dipping it in the sauce, but I didn't need that much bread. At the end of the meal, we got to talking, story-telling, and laughing, and EP decided we needed some Becherovka shots (35 CZK each). I tried and failed to talk him out of it. And then he ordered another round. And then another. In total, I think we had 7 shots and 7 beers between us. But it could have been more. I believe but cannot confirm that I lost one of the tabs. 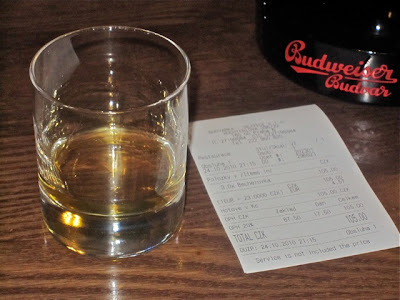 The bill for the three of us, including the drinks that I can document, was 1104 CZK. Basically, the food was cheap, and the quality was low. I felt very bad the next day. I remembered why I generally swore off Becherovka a long time ago. 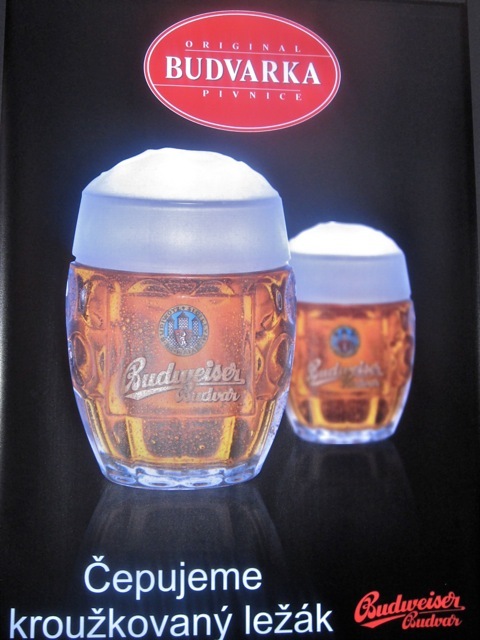 But through my headache haze, I decided I'd be happy to return to Budvarka for the beer. It'd be the best way to kill my memories of the food. 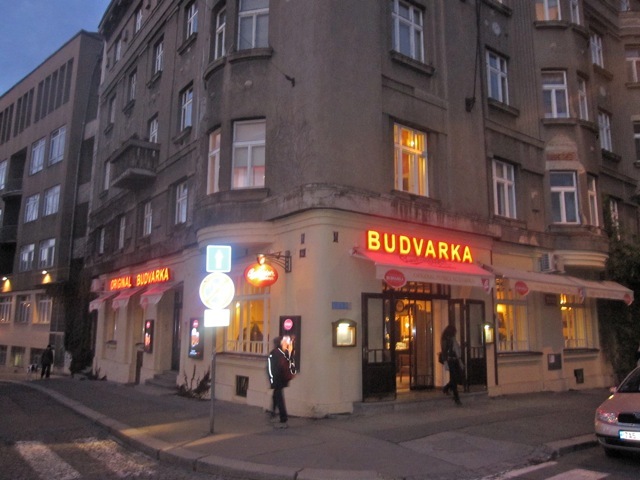 I've always been impressed with the food, its quality and its quantity, and the price, at Budvarka. 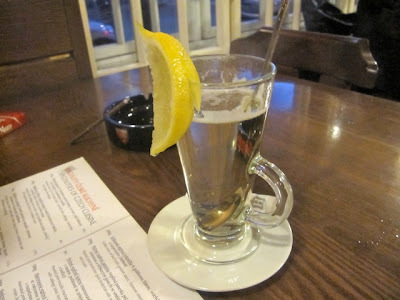 And, of course, impressed by the beer. The 1/2 duck is outstanding. I have found the service to be very attentive, too. What I don't like is the atmosphere, or lack thereof. 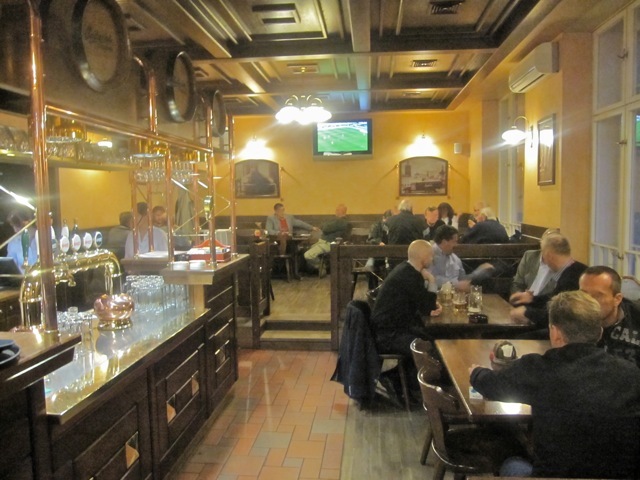 It's too much like a typical Czech pub, with harsh lighting and bare tables and a certain brown coldness to it all. 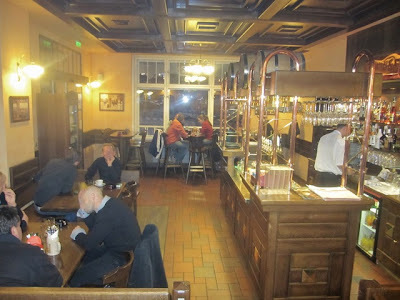 (The front room with the taps is slightly better, but I believe that's the smoking room.) It's my go-to place for Czech food, either with visitors or when you just need a good duck and a half-liter of Budvar. He moved his blog to a new URL. I've fixed it -- should work now.